Kitty Tylney and Catherine Howard are joint to the hip, both growing up with a group of girls who dream of joining court. Then Cat does it, she worms her way in and Kitty follows suit. They're both thrusted into the central workings of court but Kitty discovers it's might be too late to escape after falling in too deep. 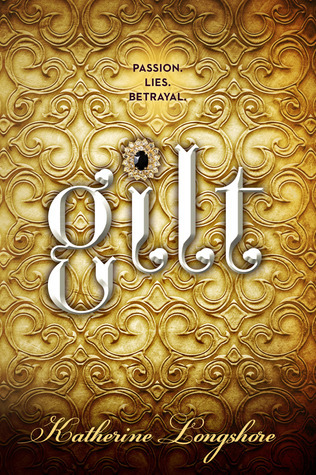 Gilt had me hooked right from the start, although I can't really pinpoint why. It might be because the pacing was done just right and the writing was easy to read. It was straight to the point, compact and engaging. Longshore builds on the Tudor world with elements of scandal and passion, both factors that aren't new to historical fiction, but one of the many reasons why I actually like this genre. I know it's not historically accurate, but it's such a fun way to explore history and its characters. What I liked most were the bigger issues of friendship and loyalty, and self-interests. Kitty constantly had to question her loyalties and if her priorities were where they should be. It opens up to whether being best friends with someone justifies the actions that they commit and what you do to help them. Or do you step in and try to prevent them from doing what they shouldn't be doing? It's the whole matter of whether you have to put your self-interest first or protect those you care about the most. Kitty, as a character, is definitely likeable. She's smart, strong willed and knows her worth. Her only fault, really, is being friends with Cat and having to be dragged into the courts happenings. Cat is a character that, from what I've read about her, isn't portrayed in a great light. She's ambitious and attractive, but only uses her head to achieve what she needs without thinking of the consequences. I didn't particularly like any of the other characters, finding none of them quite memorable. It was only the shadier characters that drew out stronger emotions from me. I flew through Gilt in a few hours and loved every moment of it. Since then I've bought Longshore's other novel and am so excited to read it. I definitely recommend it, especially if you love historical fiction. It was more the writing and the plot that boosted the novel, with the characters being pretty one-sided, but that's not noticeable whilst reading it.